Oxford, the "City of Dreaming Spires", is famous for its University, whose buildings include some of England's greatest architecture. It sits at the confluence of the Thames and Cherwell rivers. 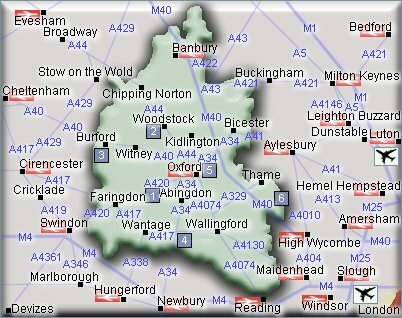 Oxford - Travel by road - Oxford is about 6 miles west of Junction 8 of the M 40 Motorway. The M 40 Motorway links London to the West Midlands. Oxford is about 60 miles from Solihull, Birmingham and 60 miles from London. Oxford - Travel by road - Oxford is connected to London, the M25 and the Midlands by the M40 motorway. Junctions 8 and 9 link directly to the city. The Oxford ring road provides direct access to the south and west coast ports of Southampton, Portsmouth and Bristol via the A34. Oxford - Travel by train - Oxford Station, Park End Street, Oxford, Oxfordshire, OX1 1HS. Customer service 08457 000 125. CCTV. Ticket office. Waiting room. Refreshment facilities. Pay phone. Shops. Toilets. Wheelchair accessible toilets. Whole station step free access. Wheelchairs available. Air - Just an hour from central London, Oxford is easy to reach from major airports. Oxford - Sport - North Oxford Golf Club, Banbury Road, Oxford, Oxfordshire, OX2 8EZ. Tel: 01865 554415. About 4 miles north of Oxford. Oxford - Sport - Oxford United FC, Kassam Stadium, Grenoble Rd, Oxford, OX4 4XP. Tel: 01865-337-533. ICE SKATING OXFORD, Oxpens Road, Oxford, OX1 1RX. Tel: 01865 467000. Oxford - Shopping - Marks & Spencer, 13-18 Queen Street, Oxford, Oxfordshire, OX1 1AB. Tel: 01865 248075. Marks & Spencer - Summertown, 242-254 Banbury Road, Summertown, Oxford, OX2 7DE. Tel: 01865 316873. British Home Stores Oxford - 22 Queen Street, Oxford, OX1 1EP. Tel: 0845 8410245. Boots The Chemists. Tel: 01865 247461. North Parade Post Office. Tel: 01865 559671. Oxford - Entertainment - Oxford Playhouse Tel: 01865 305305. Odeon Oxford Tel: 0800 138 3315. Oxford is 60 miles from London. It is 41 miles from Banbury to Wantage and 31 miles from Burford to Thame. Airports indicated are Luton and Heathrow. Oxford is about 6 miles west of Junction 8 of the M 40 Motorway. Rail Stations (Not all stations shown). There is a station in Oxford. - Kingston Bagpuize House, Kingston Bagpuize, Near Abingdon, Oxfordshire, OX13 5AX. Tel: 01865 820259. kingstonbagpuizehouse.org.uk. - Blenheim Palace, Woodstock, Oxfordshire OX20 1PX Tel: 08700 602 080. blenheimpalace.com. - Cotswold Wildlife Park and Gardens, BURFORD, OXFORDSHIRE, OX18 4JP. Tel: 01993 823006. - Didcot Railway Centre, DIDCOT, Oxfordshire, OX11 7NJ. TEL: +44 (0) 1235-817200. didcotrailwaycentre.org.uk. - Ashmolean Museum, Beaumont Street, Oxford, UK, OX1 2PH. Tel: (01865) 278000. ashmol.ox.ac.uk. - The Chinnor & Princes Risborough Railway, Chinnor Station, Station Approach, Station Road, CHINNOR, Oxfordshire, OX39 4ER. For hotels accommodation in other areas nearby see Bicester hotels & Abingdon hotels.